Frank and Fritz are shown here on October 15th during FPB's gig at Colonial Square in Utica, NY. Gabe relaxes a bit with his Parker bass on October 15, 2010 in Utica, NY. Tom fuels up during FPB's gig at Colonial Square in Utica, NY on October 15th. Fritz's Polka Band and Fulton Chain Gang close out their "10-10-10" gig (October 10, 2010) in Lee Center, NY with a big jam session to bring the event to a festive finish. Fritz is pictured here with New York State Assemblyman Dave Townsend who sang 'Old Time Rock and Roll' with FPB on October 10th. 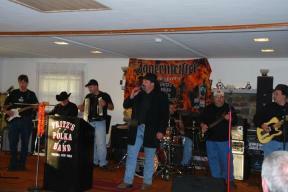 Fritz's Polka Band is pictured here during their "10-10-10" gig with the Fulton Chain Gang at Yaworski's Country Inn. Fritz's Polka Band rips through a tune on October 9th at the Tri Valley Ski Club Oktoberfest in Chittenango, NY. It's Jager Time with FPB and members of the FPB Fan Club at the Tri Valley Ski Club Oktoberfest on October 9, 2010. Frank plays bass while dancing with Ashe and Rebecca during FPB's gig at the Tri Valley Ski Club Oktoberfest on October 9th. FPB's twin guitar threat of Tom Campbell and Frank Nelson as pictured at the Tri Valley Ski Club Oktoberfest in Chittenango, NY on October 9, 2010. Mike keeps the beat on this custom FPB/Jagermeister drumkit on October 9th at the Tri Valley Ski Club. Mike and Fritz are pictured with FPB Fan Club Member, Mark Sutter and members of his family on October 9th at the Tri Valley Ski Club Oktoberfest. As the stage appeared for Fritz's Polka Band on October 9, 2010 at the Tri Valley Ski Club Oktoberfest. Mike and Fritz have a Jager toast with FPB Fan Club Members, Chris Heberle and Dave Halsey during the Tri Valley Ski Club Oktoberfest on October 9th in Chittenango, NY. Jagermeister Punch makes for a joyous start to the Tri Valley Ski Club Oktoberfest on October 9, 2010.